If you live in the Great Lakes basin and have been on or even near a road recently, you might be feeling unreasonably ragey at the mere mention of lake effect snow. We get it. But bear with us, because we’re doing some cool science we’d like to tell you about. It may even make your commute easier someday, or at least more predictable. GLERL scientists are working with researchers at the University of Michigan’s Cooperative Institute for Great Lakes Research (CIGLR), the National Weather Service, and NOAA’s Earth Systems Research Laboratory (ESRL) to make lake effect snow forecasts in the Great Lakes better. NOAA’s high resolution rapid refresh (HRRR) model is the most commonly used weather model for predicting lake effect snow. An experimental version runs on a beastly high-performance computer at ESRL in Colorado, and predicts a whole list of atmospheric variables (including snowfall) every 15 minutes. The model relies on water surface temperature data, collected via satellite, to make its predictions. 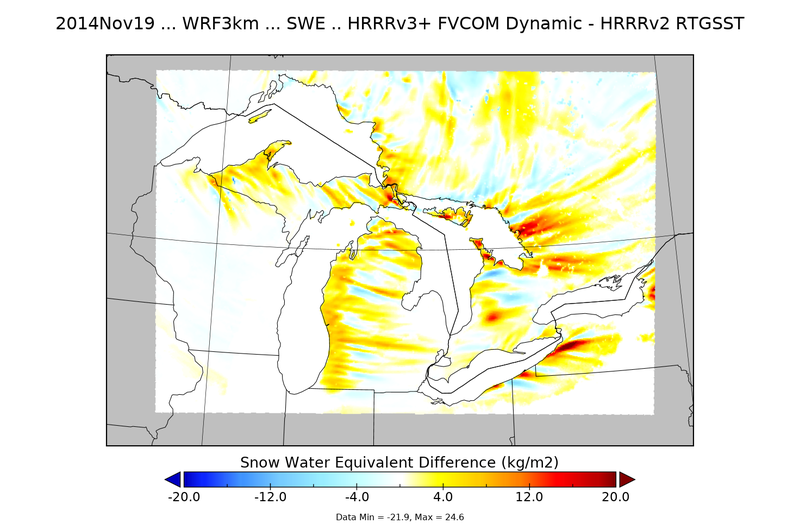 It’s important to give the model accurate water surface temperatures to estimate evaporation across the Great Lakes, since it is the main driver of lake effect snow. Unfortunately, satellite temperature data has limitations. If clouds keep satellites from measuring the temperature at a specific location, the weather model will just use the most recent measurement it has. Since it’s especially cloudy in the Great Lakes during the lake effect snow season (late fall and early winter), that data could be days old. Because lake temperatures are changing quite rapidly this time of year, days-old data just doesn’t cut it. As it turns out, GLERL already has a model that predicts Great Lakes surface temperature pretty well. The Great Lakes Operational Forecast System (GLOFS) spits out lake surface temperatures every hour. If we tell the weather model to use GLOFS output instead of satellite data, it has the potential to do a far better job of forecasting lake effect snow. Linking two models like this is called “coupling”. GLOFS actually already uses input from HRRR—wind, air temperature, pressure, clouds and humidity data all inform GLOFS’ predictions. We’re just coupling the models in both directions. HRRR will send its output to GLOFS, GLOFS will “talk back” with its own predictions of water surface temperature (and ice cover), and HRRR will produce a (hopefully) more informed prediction of lake effect snow. Initial results are promising. We used the coupled models to do a ‘hindcast’ (a forecast for the past) to predict lake effect snow for a major event over Lake Erie in November of 2014. They did a significantly better job than without coupling. The figure below shows the difference. The coupled models improved cumulative snow water equivalent forecasts. Red shows where the model increased snowfall. You’ll notice a band of blue on the southeastern edge of Lake Erie, indicating that the coupled models predicted less lake effect snow in that area. There’s a band of orange directly to the north of it, where the coupled models predicted more lake effect snow. What you’re seeing is the coupled model predicting the same band of snow, but further north, closer to where it actually fell. That storm slammed the city of Buffalo, New York, killing 13 people. Better lake effect snow predictions have the potential to save lives. GLERL and partners will be doing further testing this winter, and if it works out, the model coupling will be carried over in research-to-operations transitions. Categories: Research | Tags: Coupled Modeling, great lakes, lake effect snow, lake erie, lake michigan, Modeling, Research | Permalink.